This is the first in a series of regular interviews with Giants prospects, current players, coaches and other characters in Giants nation. This interview was conducted over the course of the last month soon after the end of the regular season. 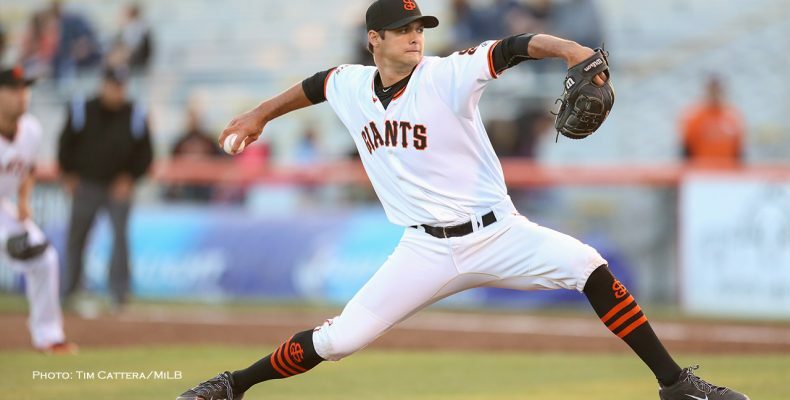 I want to thank Tyler Beede for taking the time out to be interviewed. Greek Giant: Congratulations on a great season. Tell us what was going through your mind when you attended your first Major League Spring Training with the Giants? What do you remember most about that experience? Tyler Beede: Thank you so much! I was really excited to be invited and get to be around those guys! I knew I would only be there for a few weeks so i made sure to soak up as much knowledge as i could while I was around those guys. I remember a lot of the interactions I was able to have with the guys, throwing in a few games and learning a lot from watching those guys go about their business. It really helped me heading into the season! GG: How have you adjusted your approach to pitching as you have progressed in the Giants Farm system? What do you notice most about the game and opposing hitters as you progress to different levels such as from Richmond to San Jose? TB: I’ve adjusted in multiple ways. The first year I adjusted a lot of my pitching style from more of a hard throwing, low control pitcher to a sinker/cutter command pitcher. I still didn’t command the ball the way I had hoped when I initially got to Richmond in 2015 so I knew coming into this season I had some adjustments to make. I put 30 lbs on in hopes of staying strong through out the whole season and gaining my velocity back. I’m most happy with those two things, with how well I finished and my velocity jump the whole season. I’ve noticed the experienced approach of each hitter and how much more patient each hitter is. The game is always evolving and so as a pitcher we must evolve as well and continue to improve to stay sharp as the talent within the game gets better and better, the challenge is great. GG: What type of training and conditioning do you do during the off-season to stay in shape? Do you throw regularly? TB: As soon as the off-season begins I’m getting in the gym and preparing for the next season. I’ve spent 9 years with Eric Cressey at Cressey Sports Performance in Massachusetts working with them on consistent nutrition, work outs. What I’ve found is truly trusting their process and their recommendations. They have pushed my career to the next level each off-season. I begin throwing each off-season around December, to give my arm the proper rest. GG: Your numbers with Richmond were excellent at 8-7 with an era of 2.81 and only allowing 136 hits in 147.1 innings pitched. Your strikeout to walk ratio of 135 ks to 53 walks is solid. Would you consider yourself a strikeout pitcher or someone who pitches to contact? TB: I felt I got better each month this season which was a credit to our coaching staff and front office in consistently challenging me to be the best I can be. I improved every pitch through out the season which is a big reason my strikeout rate went way up. I felt like my command this year was the best it has ever been so I don’t pay attention to the numbers as much even though there was a stretch where I wasn’t too pleased with the free passes I was giving up leading to some more stressful innings than I’d like. Last year I was a contact pitcher, but this year I was getting ahead early and then hunting that Strikeout for sure! GG: What was your favorite team growing up? TB: I grew up in Boston so naturally I was a Red Sox fan growing up. GG: What current pitchers in the Major Leagues do you look to as role models or players you find inspiration from and Why? TB: I think there is something to learn from everyone in this game, especially people who have been in the game and around the game for a long time. I look up to guys like Jake Peavy and Matt Cain for how they treat the young guys in spring training. It’s truly a blessing to be associated with the Giants because from top to bottom in the organization people care about each other and that’s rare in this game. GG: What went on in your mind and among your family once you realized you were taken in the first round by the Giants in 2014? TB: I knew there wasn’t a better organization in the game to be drafted by and that selection alone was a boost in my confidence because it shows a team has interest in you, has belief in you and is putting you in a position to help contribute to a very successful organization. I couldn’t have picked a better team and it was truly a dream come true and still is to this day. GG: Many fans and analysts believe there will be an opening in the Giants starting rotation in 2017 and that you are a prime candidate for that spot. How do you feel about this possibility? TB: I’m very excited to get back to Arizona next spring and compete. If it happens to be for a spot in the rotation that’s great, but I’m not too focused on the outcome as I am trusting in the process and being the best I can be going into the spring. I’m very confident I can pitch at that level and hope to one day contribute, but that’s something that is out of my control. The Giants do a great job of developing players and getting them ready for when that opportunity presents itself and I certainly feel that they’ve prepared me very well, and I’m certainly ready for that opportunity. I’d love to be apart of such a special team, with a special group of guys and be apart of another championship for this Organization. GG: The Giants with Righetti, Mark Gardner, Bruce Bochy and others are known for their expertise in developing and coaching pitchers at the Major League Level. Can you describe what types of interactions you have had with them while in Spring Training? TB: I had the opportunity to be around them for about a month last spring and the wealth of knowledge those men have is incredible. You can learn things from them from just watching them, watching the other players as well. But they are really great at simplifying things from a pitching perspective and really making you feel comfortable. It will be great to play for them. GG: What coach or coaches have had the biggest impact on you as a pitcher for mechanics and pitches or psychological approaches to the game and why? TB: There have been a large amount of coaches who have a had a great impact on me within the game of baseball. From my dad, to coach Swedburg and Coach Margraf in High School, to coach Corbin at Vanderbilt and now through out the Giants organization I’ve had some of the best instruction and coaching a player could have. Matt Yourkin, Mike Couchee and Steve Kline have had major impacts on me as a pitcher and the list goes on for those guys that have truly taken my game to the next level.